The filtering problem consists of recursively estimating the state of an uncertain variable from noisy measurements. 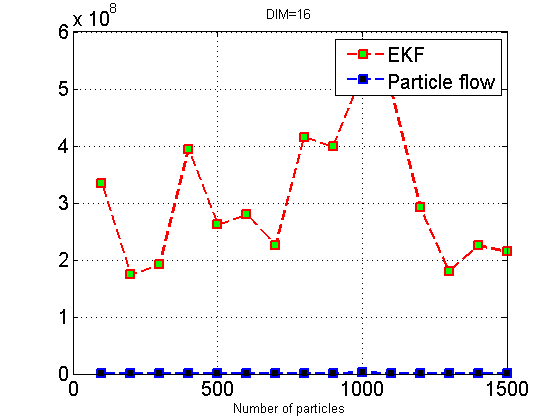 One kind of nonlinear filtering algorithms is to compute the sufficient statistics characterizing the conditional probability density function (Extended Kalman Filter, Unscented Kalman Filter), the other kind is to approximate the conditional density using Monte Carlo sampling method (standard Particle Filter , MCMC). 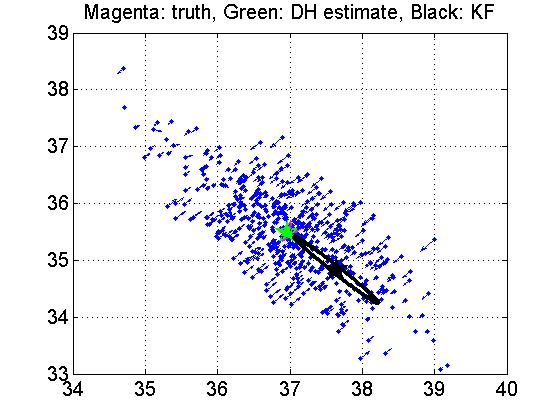 Daum-Huang (DH) nonlinear filter[1-3] is different from these kind of filters, since it moves the particles from a good location in the prior distribution to a good location in the posterior distribution in a deterministic way. 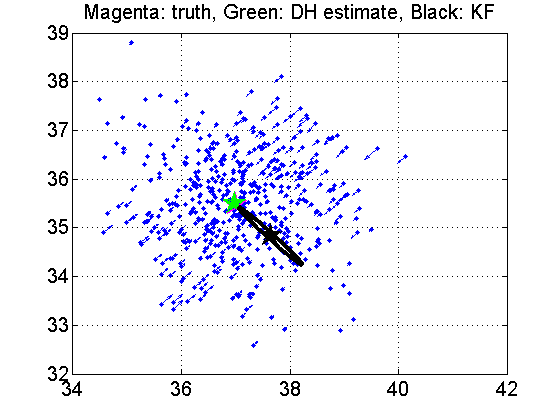 Moreover the DH filter does not resample and does not rely on the proposal density, it just introduces log-homotopy between the prior and posterior and then creates a differential equation to implement the Baye's rule. By integrating the differential equations the set of particles could represent the posterior density very well. The arrows show the direction of flow of each particle, and the speed of flow is represented by the length of each arrow. It is ovbious that the particles are moved closer to the real state. F. Daum and J. Huang, “Nonlinear filters with log-homotopy,”in Proc. SPIE Conf. Signal and Data Processing of Small Targets,San Diego, CA, USA, Sept. 2007. F. Daum and J. Huang, “Nonlinear filters with particle flowinduced by log-homotopy,” in Proc. SPIE Conf. Signal Proc.,Sensor Fusion, Target Recog., Orlando, FL, USA, Apr. 2009. F. Daum, J. Huang, and A. Noushin, “Exact particle flow fornonlinear filters,” in Proc. SPIE Conf. Signal Proc., Sensor Fusion, Target Recog., Orlando, FL, USA, Apr. 2010.